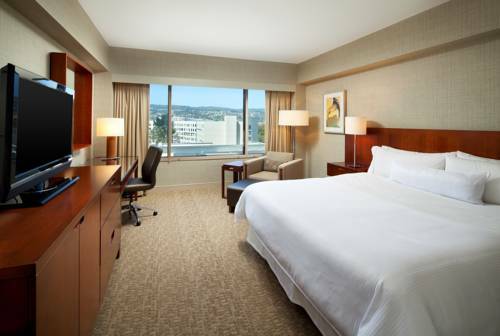 Five minutes from San Francisco International Airport and 20 minutes from downtown San Francisco, The Westin San Francisco Airport offers business travelers easy access to the city and Silicon Valley via major freeways and public transport. Designed with your unique needs in mind, the hotel features more than 20,000 square feet of meeting space and an airport shuttle. An indoor pool, WestinWORKOUT Fitness Studio, and access to bayfront jogging trails make it easy to stay fit on the road. Each of our 397 soundproof guest rooms and suites is an oasis of quiet comfort. Stay productive with a work desk and High Speed Internet Access, or rejuvenate your body and brain with an amazing nights sleep in the Heavenly Bed. Runway Caf : When you re in a hurry, stop by Runway Caf for grab-and-go bites, pastries, and Starbucks coffee drinks made to order. Grill & Vine: Our modernized reinterpretation of the classic bar & grill is designed in a signature tavern style. Upscale yet casual and comfortable, Grill & Vine offers American cuisine with extensive breakfast and all-day menus. Situated on a peninsula between the Silicon Valley and San Francisco, The Westin San Francisco Airport is a convenient gateway to the many allures of the Bay Area. The hotel is located in Millbrae, just five minutes from San Francisco International Airport and 20 minutes from downtown San Francisco. Major freeways and public transportation make it easy to get around the area. Guests will find no shortage of restaurants and shops in the area. Stanford Shopping Center in Palo Alto and the neighborhoods of Union Square, Chinatown, and Haight-Ashbury in San Francisco offer endless hours of shopping and sightseeing. Explore cultural landmarks like the Golden Gate Bridge and Alcatraz Island while experiencing the areas famous fog, or head over to Yerba Buena Gardens and take in a concert or theatrical performance. From the citys picturesque Victorians to popular trolley cars and eclectic array of world-class restaurants, theres always something to see and do in San Francisco. Of course, Millbrae offers its own distinctive attractions. The hotel is located directly across from Bayfront Park, where guests can take advantage of bayside jogging and walking trails. Sports buffs can head over to the indoor go-kart racing and golf complex, while food enthusiasts will want to sample the menu at the nearby In-N-Out burger, a culinary experience of California.